The Strongest Guarantee— Even for Your Printer! The Strongest Guarantee in the Industry — Even for Your Printer! All of Laserfleet’s compatible imaging products are guaranteed to work as good as or better than the OEM brands. Our cartridges have the same lifespan as their OEM counterparts, and all are guaranteed to arrive to you 100% free of defects. 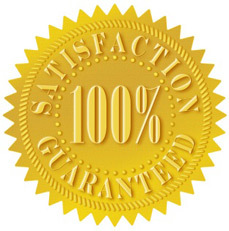 In addition, all of our products come complete with a 100% Satisfaction Guarantee, or your money back! We’re so confident that you will like our products that much! As extra peace of mind, Laserfleet has been in business since 1988, and has never had any compatible imaging supply cause damage to a printer. If for any reason one of our products were to create a problem, we will, at no cost to you, come out promptly and fix the problem. We reserve the right to have the printer repaired by a Laserfleet technician only, otherwise the guarantee is void. Laserfleet is always willing to help as much as possible when it pertains to warranty claims for brand name supplies. However, guarantees for brand name supplies are based upon whatever warranties the product manufacturers are willing to extend. This varies from brand to brand, and Laserfleet does not have any control, nor do we offer any additional guarantees to these products. All labor time is free for warranted service calls, and all printer parts purchased and installed by Laserfleet are subject to the manufacturers’ replacement policy. Standard parts warranty time is generally 90 days from the installation date, while some parts carry a 6 month warranty. Please ask your Customer Service representative for your specific warranty details. Laserfleet’s warranties apply per incident, per repair performed by Laserfleet. We do not warrant any work performed by other service providers, nor do we warrant parts which we did not install. Also, we will not honor service work done by others which may have caused damages to any parts we may have previously installed. In addition, having called for service, the customer is responsible for providing a safe working environment for the technician, along with properly grounded electrical outlets for us to work with. Laserfleet will not be held liable for the following: power surges from any onsite electrical outlet, acts of God, customer/employee abuse to a printer or theft. If any of the above items are discovered, all warranties are null and void.